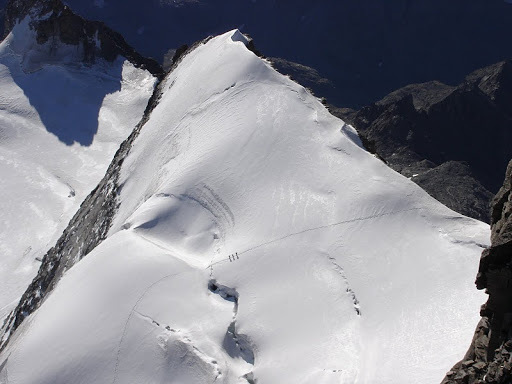 I’d originally planned to join Icicle Mountaineering’s Alpine Autonomy course but the weeks didn’t quite work out so I was booked on the Intro 4000m Summits & Skills course, excited about my first taste of alpine walking/climbing. My slight concern with the intro course was that it assumed no previous experience though I had already enjoyed a modicum of UK winter skills and some rock-climbing. My other main concern was fitness, or lack of it. 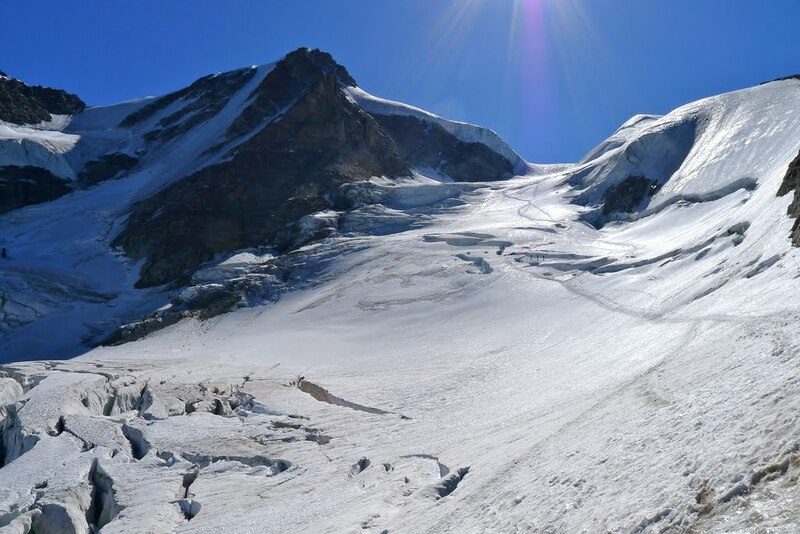 Earlier in the year I had it in mind that I wanted to attempt Mont Blanc but research soon led me to realise the summer window is rather short and non of the tour companies hold back in their assessment of the physical demands. Icicle themselves are fairly blunt on the subject – they want people to be prepared and there is also the responsibility to the others in your group since, if on a major ascent, if one turns back then everyone turns back. Icicle’s fitness recommendation for MB is that you can complete a half-marathon in under 1hr 45min and ideally marathon finess level. I’m not sure I could complete a half-marathon period! – and so I set my sights lower, aimed at gaining more alpine skills and experience. I actually suspected they were over-playing the fitness angle but on arrival I quickly realised that everyone else was either a runner (marathons, fell-runners, triathlons) or had been undertaking serious training. Kingsley, the Icicle main-man, had himself just finished the North Face Ultra-Trail race involving 100km and 5,000m of ascent. I’d had good intentions over the summer but injury (badly sprained ankle) and illness (a succession of man-flu) had disrupted preparations and I left for Geneva still dosed on antibiotics and echinacea. Meeting at the Icicle office in Chamonix there were three of us on the Intro Summits & Skills course, half a dozen for Mont Blanc, two guys aiming for the Matterhorn and others focusing on climbing classic rock routes. Joining me on the Intro course were Jason and Tom, the latter was also staying on for a further week to attempt Mont Blanc. The evening was spent assessing each persons kit and sorting out who needed to rent boots, crampons, axe, helmet, harnesses etc. 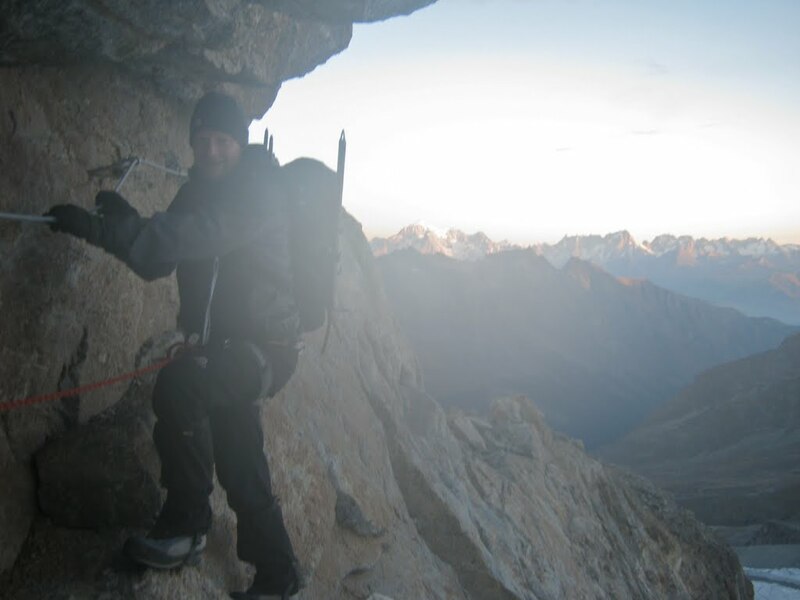 I’d taken my own stuff and was fortunate that, after some deliberation, I was allowed to use my Scarpa Charmox B2 boots, rather than rent a pair of clumpy B3 boots. In my favour was the fact that the weather forecast was good, otherwise the suggestion was my boots would not be warm enough. Setting the pattern for the week, breakfast was served at 7.30 giving time for getting ready to meet our guides at 8.30. Jason, Tom and I we were to be guided by Kingsley on the first day and then to be joined by Stefano, an italian guide, for the rest of the week. The first day was really a straightforward acclimatisation day and a refresher on navigation and timing. We got the train up the valley to Montroc, then ascended through the trees, picking up part of the TMB route when we started to ascend from about 1300m up to the snow-line. I had to admit I found it tough going – we were ascending 1,000m (Snowdon summit from Pen-y-pass is less than 700m) and I was struggling with the pace, definitely feeling the after-effects of my illness the week before. Kingsley was showing no mercy as she showed no ill-effects from his 100km race a few days earlier. As we gained height the temperature noticably dropped and the drizzle turned to snow. An occasional break in the clouds gave the odd short-lived, post-card view, per the photo below. We eventually reached Chalet du Lac Blanc at 2352m and quickly devoured some lunch to keep warm and then started the long ascent all the way back into Chamonix. I was already wondering whether my fitness would show later in the week. 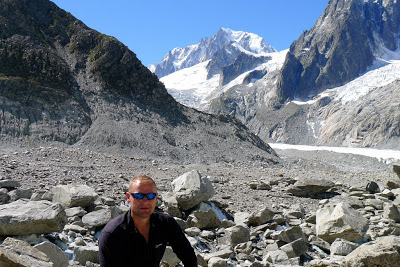 We caught the Montenvers furnicular railway up to the Mer de Glace glacier. The close-up view of the glacier was spectacular, framed by the blue-sky and the majestic peaks, the ice was not the pure white river I was expecting due to a liberal coating of glacial moraine. The actual glacier was now some 200m below us though the flanks of the valley clearly showed the glacier had once been much higher. 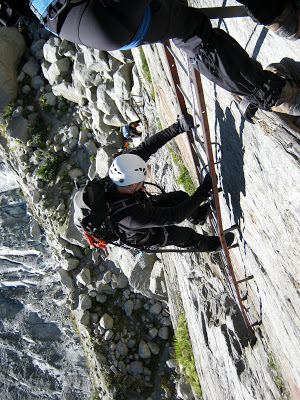 After a short walk down a path we donned harness and helmets for the 200m descent down a succession of vertical ladders and cables to eventually reach the level of the glacier. We picked our way over the moraine and onto the glacier proper, heading up the valley to spend the morning perfecting crampon and ice-axe technique. After lunch we headed further up the glacier to practice some ice-climbing. A leisurely descent is usual after a long day in the UK hills, so the prospect of ascending the ladders after a long hot day in the sun was not welcomed. They were like a giant stepper-machine – rung after rung it went on, my grip slightly more tense, my foot placement slightly more precise as we slowly gained height. The train was a far leisurely way down the mountain and we eventually plonked ourselves in the Icicle office at 5.30 for tea/biscuits and an hours instruction on knots. 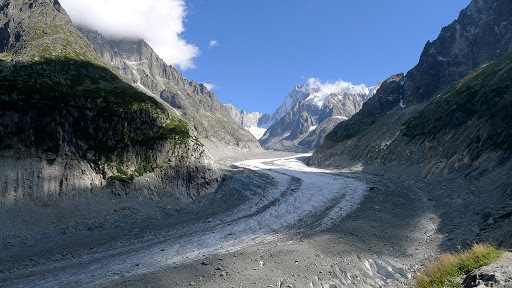 Back to the Mer de Glace – this time to head further up the glacier to where it splits – one leg heading east towards the imposing face of the Grand Jorasses and the other snaking south-west to reveal the eastern flanks of Mont Blanc itself. We donned crampons and headed upwards. The glacier was dry (i.e. 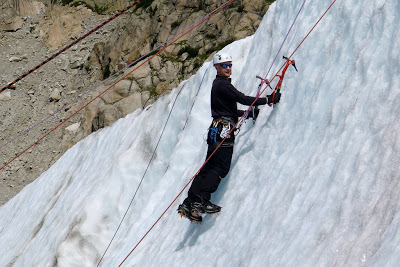 not covered in snow) so crevasses were evident, largely negating the need to rope up, but we also needed the experience so we short-roped – a human-chain – practising moving together, keeping the rope off the ground but not so tight to pull on the person in front. We had hoped to ascend to the Refuge du Couvercle at 2687m but as the 9am train did not run (not enough passengers!!) we were behind schedule. Continuing to the hut ran the risk of missing the last train down in the evening,so we decided to forgo the hut and after a spot of lunch headed back down the glacier to practice setting up ice anchors/belays and crevasse rescue systems. It was a longer descent down the glacier and the inevitable ladders at the end, but I had really enjoyed the more technical skills aspect of the day. With a drive to Gran Paradiso planned for after lunch we had the morning free for a spot of rock-climbing. 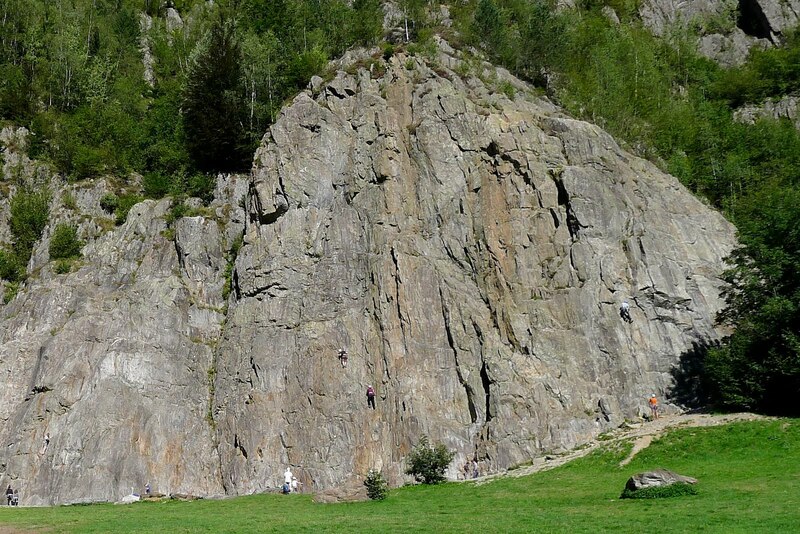 A five-minute drive brought us to Lac de Gaillands and a great crag on the outskirts of Chamonix. With numerous bolted routes Stefano our Italian guide quickly lead up and we spent the morning on four different routes before grabbing lunch. 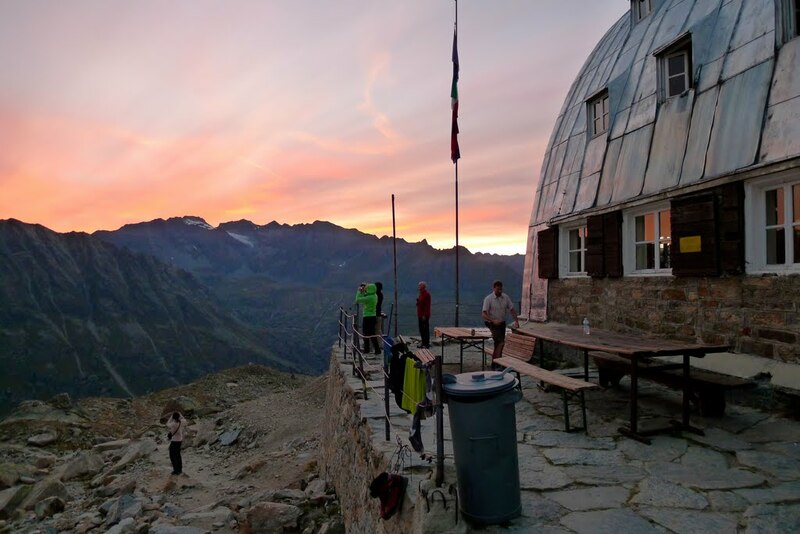 An hours drive through the Mont Blanc tunnel into Italy led us to the Gran Paradiso national park and as we drove up the Valsaverenche we saw our first glimpse of the summit. This was to be our last view of it until the following morning. Parking at Pont we sorted our gear and after a swift cofee set off up a well made path to arrive some 2 hours and 800m higher at the Vittorio Emanuele II hut – 2635m. We mooched around for a few hours, lazing in the sun and having a sneaky beer before dinner at 7. After another check of our gear we were in bed by 9pm with the alarm set for 3.30am. Blearily-eyed, a quick breakfast had us on our way by head-torch by 4.30am. 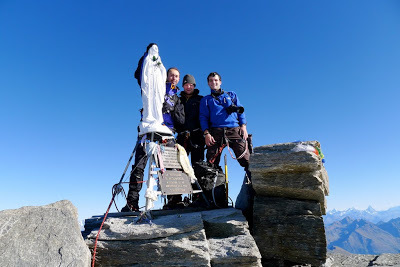 With 1350m of ascent ahead of us Gran Paradiso is one of the longer summit days, so it was just a case of plodding steadily upwards, picking our way through a boulder field and up the moraine, having a quick stop for a drink every hour or so. 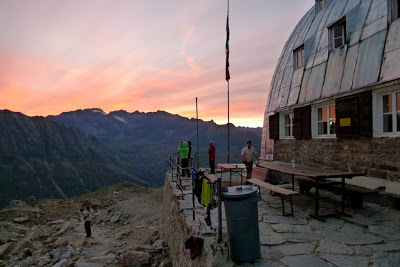 As the first hint of daylight appeared the silhouette of Gran Paradiso slowly revealed itself. We reached the glacier and now had a choice of either ascending the glacier direct or turning right and ascending a rocky, scrambly rib with some via ferrata. We chose the latter which was far more fun until the rock finished and it was time to rope up and don crampons, whereupon we were immediately into a calf-busting steep climb up to the col where we re-joined the route up from the glacier. Looking over my shoulder I could see Mont Blanc across the Alps, replete with a small halo of a cloud above it. From here it was going to be a long slog of over an hour up the snow and ice, roped up and following in the foot-steps of others. I was last on the rope so had the benefit of 3 people pulling me up! The last 20m required a scramble up and along a narrowing blocky ridge so we removed the carmpons and climbed up. The sting in the tail was a vertical wall with a precarious 10cm ledge for your feet and little for your your hands. It was only about 12ft across with a bolted karabiner at each end through which we could loop our rope for some protection. A few moves later and we were standing on the summit of Gran Paradiso, 4061m, with amazing views across the whole Alps. 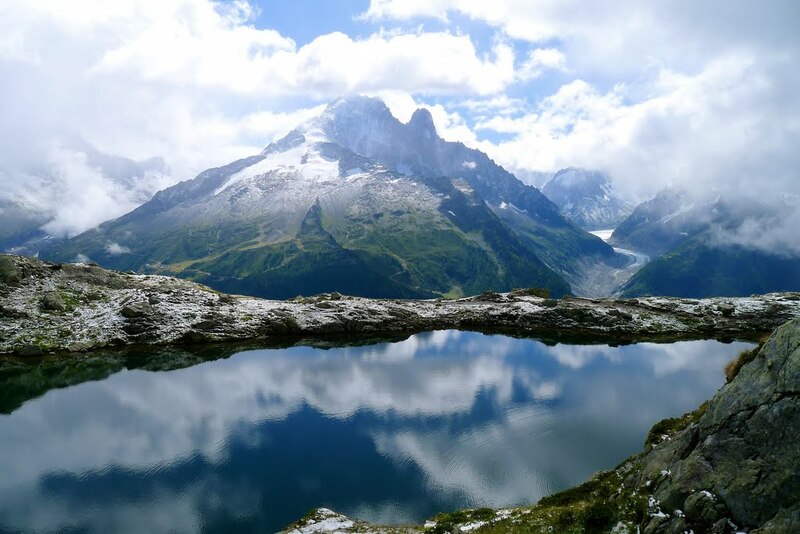 Stephano reeled off the names but the Matterhorn and Mont Blanc announced themselves in the distance. There’s an inevitable sense of achievement, even relief, at reaching the summit, but as all true mountaineers tell you – you’re only half-way there! We still had over 2000m of descent ahead of us. Re-tracing our steps down to the col, we veered off and took the glaicer route, meandering around spectacular crevasses. The descent to the hut was around 3 hours and with sore feet and knees spaghetti bolognese and a celebratory beer were hit the spot before the final 800m of descent back to the car. We did it! My fitness held up though there were a couple of times when I felt that the rope was there to pull me up. Being roped up gives you that extra incentive to keep going, keep plodding, whereas ordinarily you might stop more often for a quick breather. 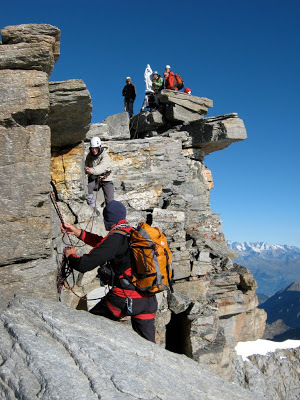 The fast and light alpine philosophy is an approach honed and adapted to the environment. The sheer scale of the mountains, the changeability of conditions and the altitude demands fitness, experience and speed for safe passage. Thus early starts and a steady relentless pace with few stops is the norm. I could see now that Icicle were not over-playing the fitness aspect and why most of the guides in Chamonix are small and skinny! Overall I really enjoyed the mix of practical instruction and real experience in the Alps, learning skills that give me the knowledge and confidence to move safely in the alpine environment. You can learn similar technical skills in the UK or from books/DVD’s (the BMC Alpine Essentials DVD is a good intro) but your can’t replicate the experience of being there. In hindsight I would have preferred to push myself on the Alpine Autonomy course (notwithstanding the extra fitness demanded) as I felt I learnt little new on the first few days, but the week was good experience nonetheless. I’d definitely recommend Icicle Mountaineering to anyone else thinking of doing something similar. They have a great range of course for all abilities and a straightforward, down-to-earth approach. 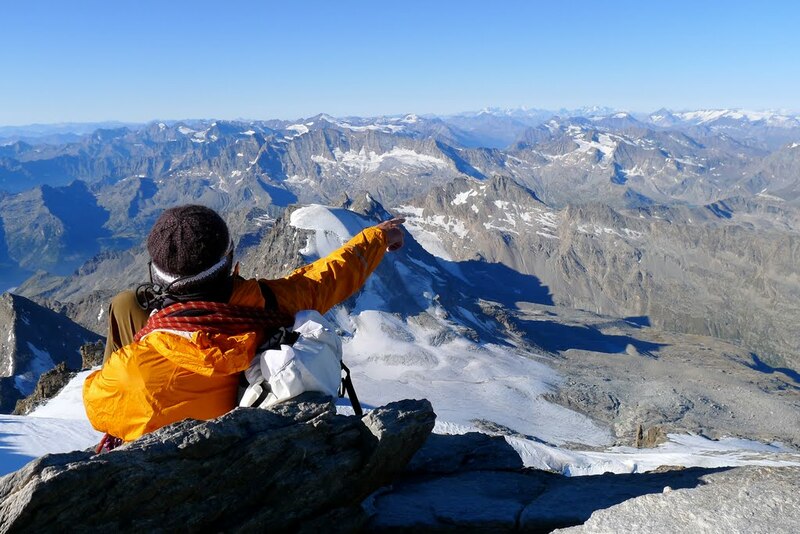 Sarah, in the Chamonix office, is only too happy to answer any questions or concerns when selecting an appropriate course. Mont Blanc will have to wait for next year! Next → Next post: It’s been a while..? Sounds fantastic Nigel. Exactly what I fancy for next year. Some winter skills in Scotland and then getting my fitness levels up – didn't realise the fitness would need to be that high but I don't think I am that far off but there's always work to be done!! The Classic Haute Route – not the Walker's Haute Route – the Classic. 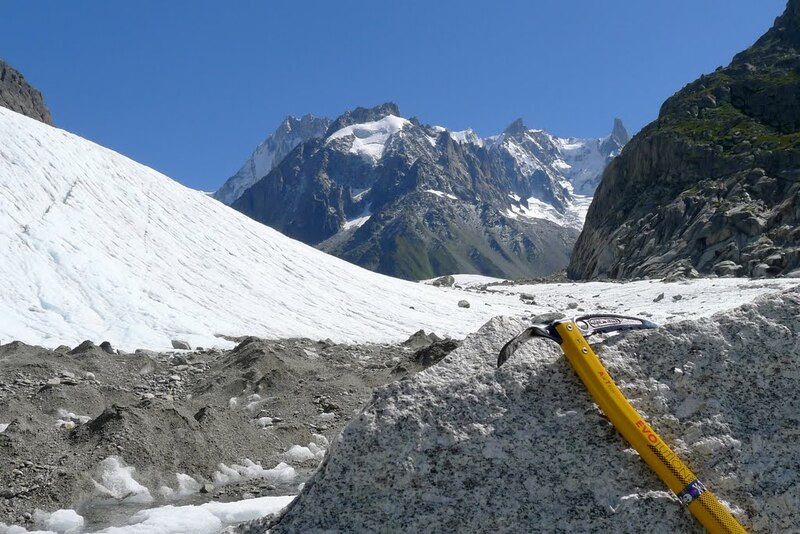 Ice-axes, crampons, glacier walking, summits. How good does that sound? 2011. Hi Maz, the Classic Haute Route next year sounds great, though I wonder if, after some Scottish Winter skills, you may even itch for something more technical?!? Think I'll look to head up to Scotland this winter too, though last winter in Wales was pretty good. stunning pictures. A great trip and something I am unlikely to emulate! This is very inspiring Nigel! I'd love to climb these charming moutains some day, although I'm still new at mountaineering.